Easter week is almost here! How have you done building anticipation and celebrating over the past few weeks of Lent? Whether you’ve joined us as #EasterPeople or not, by today there’s no denying that Easter is upon us. Most churches will celebrate Palm Sunday this soon and everyone agrees that you better grab your Easter Sunday attire if you haven’t yet! 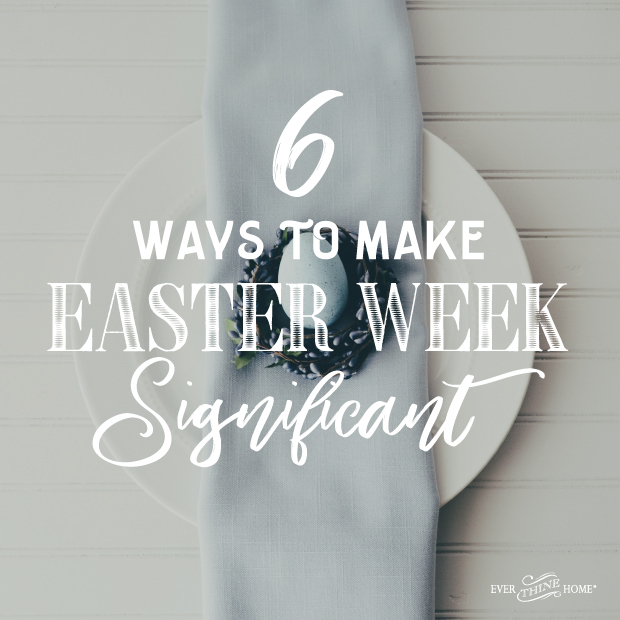 Here are 6 ways to make Holy Week and Easter Sunday meaningful, memorable, and worthy of the attention and celebration the Resurrection deserves. in your home. Have your kids reenact Palm Sunday. Help them cut out fabric or construction paper for costumes and palm branches. Make a Hosanna banner to hang across the mantle of your living room stage for the performance. Review the story in Matthew 21:1-11 to find the roles each family member can enact. If your kids love this as much as ours did you can continue on with the following stories of cleansing the temple, cursing the fig tree, etc., talking about why these acts were important for Jesus and the disciples. Then have an adult read the story of Jesus’ triumphal entry as the children act it out, and end with a prayer of gratitude. Buy seven 3-inch pillar candles, download here our candle wraps or transfers and apply to your candles. Arrange them down the center of your table or along a fireplace mantle or on a tray in your kitchen. Light the candles each day as you read the I AM statements Jesus made about Himself, found in our Holy Week Advent cards. Order our Holy Week Advent cards (LINK PRODUCT) to make time every day during Holy Week to read scripture together and build your family’s anticipation of Resurrection Sunday. Each card invites your family to spend 5-10 minutes together around the dinner table or before bedtime. Light candles as instructed each day during your reading to add to the significance. Watch The Jesus Film together to feed our image-driven minds a picture of the awe-inspiring life of Jesus as He taught, loved, healed and then died for you and me. Attend a Good Friday service. If your church doesn’t have one, go to another local church’s services. Gathering with other believers in a time of reflection and truth of what Jesus did for us the day He died on the cross will add greatly to your Easter experience. Make Saturday a day of mourning. Keep your blinds pulled or lights off all day to remind everyone that the Light of the World was extinguished on Good Friday. Cover your Holy Week candles with a black cloth for the same message. Help your family feel a sense of the loss and devastation the disciples felt the day after their Savior had died. Resurrection Sunday is the greatest celebration of all for believers in Jesus! Without the cross we would have no hope and Christmas would be meaningless. Because what Jesus accomplished for us, let’s celebrate and worship with exuberance so all the world knows Jesus is Alive forevermore! The Holy Week devotion was so good! We did it last week with our kids, ages 6,5,3,3 and it was perfect for them! I loved the connections back to the tabernacle/temple that they were able to grasp and the simple questions like “what is the purpose of a door?” And connecting simple questions like that to his I am statements. You could really tell it made them think. Thank you so much for creating this resource! It’s a favorite we’ll keep around for years. Kristy — So glad you enjoyed this and your kids began to learn about all the connections between Jesus and the Old Testament! And thanks for sharing with us that it worked for you!!! You and many others made our day today!!! Yes ma’am! We are setting up our backyard for our Easter Celebration & the kids are enjoying this Holy Week countdown. Thank you for encouraging us!